On Friday, Oct. 5, His Excellency Ambassador Daniel Mulhall visited Raleigh to share and discuss the importance of the partnership between the U.S. and Ireland. 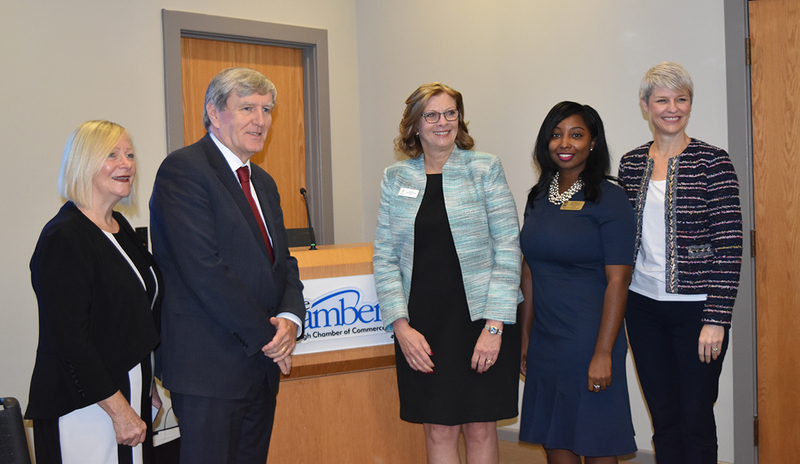 The Consulate General of Ireland for the Southeast U.S. Shane Stephens, Raleigh Mayor Nancy McFarlane, and Wake County Board of Commissioners Chairwoman Jessica Holmes joined Ambassador Mulhall for the discussion, along with Raleigh Chamber President and CEO Adrienne Cole. This conversation took place at a leadership roundtable with a variety of elected officials, community leaders, and business executives at the Raleigh Chamber. Kathleen Henry, economic development manager for Wake County Economic Development, arranged this roundtable conversation as part of the effort to help boost foreign direct investment for the Triangle region. The ambassador also spoke at length about the Triangle region and his interest due to the growing talent base, diversity in industries, and quality of life. “This area is increasingly becoming a place where Irish companies coming to the U.S. will want to locate,” said Ambassador Mulhall. When speaking about locations to visit for potential investment and partnership, Ambassador Mulhall believed that Raleigh was a top competitor against cities such as Boston and New York. Foreign Direct Investment is a key focus for Wake County Economic Development. With more than 700 foreign owned firms in the Triangle region, visits by delegations continue to be frequent due to increased interest in the region. This visit set a precedent for a prosperous relationship with North Carolina and Ireland in the future. To read more about Ambassador Mulhall’s visit to North Carolina, read the post here.